Organization is key when it comes to mailroom efficiency. A disorganized mailroom is one in which critical mail may be lost. 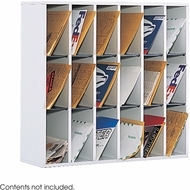 Office Chairs Unlimited offers mailroom products that can help organize and streamline the mail process in any office. Mail sorters in a variety of sizes, a sorting table with shelves, and mail carts of every style make our mailroom products a great choice.